Hey Gals and guys, I guess you're here for a reason.. You ask 'What the hell is a media kit and why do I need one?' - Well, I'm going to answer this as efficiently as possible. Please note this is my first media kit so there's so much more room for improvement. I will be tweaking every now and again just to keep it updated, it's like a CV after all. So, the other day I had some spare time on my hands and decided to browse the internet for some media-kit examples. I just wanted to get a feel of what exactly was needed, the layout, design etc. I came across a few and loved how creative they were so decided to give my own a try! To my knowledge fellow blogger Rebecca had just tweeted her media-kit so I took it as a sign and went about designing my own. I also saved hers for blogger outreach purposes.. Yes if you didn't know I do put bloggers forward for assignments since I get so many brands interested in the Blogging Gals community. How many companies actually care for your love of pizza, cats or Gossip Girl? None probably. As harsh as it sounds, all companies are interested in numbers. Cliché I know, but think of it this way, these companies are investing in you. Sponsors need to know the value of working with your blog prior to contacting you, so it's important to include relevant information in your media-kit. Do I really need a Media-Kit? Yes you do! Scrap that, of course you do! A media-kit is a great way for you to showcase your skills, achievements and makes sponsors feel like you know what you are doing. More importantly, this helps you understand your worth in terms of working with other companies. 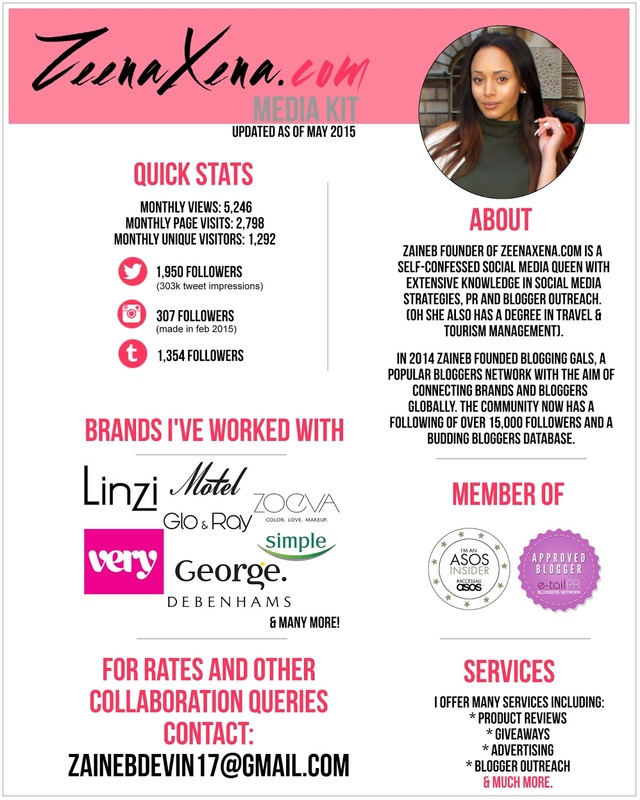 Not only can you bag yourself with great sponsorship deals and other collaborations, but you can also weed out those who perhaps are not so well suited to your blog. Ever receive those emails from PR's wanting to place content on your blog for next to nothing? Go figure. So are you ready to get started? Well duhh... let's get going! Here is an example of the Media-Kit I drafted, I have purposely left out some additional information simply because I think I could expand on what I have already. Let's just say I love having a good ol' conversation via email haha. 4. Oh you should definitely include what kind of blog you run too (I've missed that out on mine). I'm pretty sure companies will know if you're a fashion, beauty lifestyle blogger etc but this is always good to have on your media-kit. My media-kit has not only helped me collate all of my blog's information, but it has also helped me understand that I need to work so much harder on my blog in the next few months. * I used Macromedia Fireworks MX 2004 to make this so just proves you can make an even better media-kit using photoshop for example. Thank you so much for sharing this! I had never heard of a media kit before!